Thermal stress makes corals more vulnerable to effects of overfishing and pollution. Coral bleaching is one of the signs of an unhealthy coral reef. 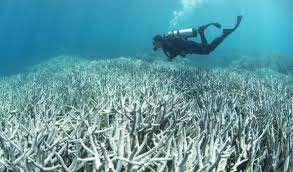 According to Rebecca Vega-Thurber 90% of the Great Barrier reef now shows signs of bleaching, likely caused by extreme high water temperatures of El Nino. High water temperatures destroy the algae that give corals their natural colour. A recent experimental study carried out on a Florida reef, and published by the group of Rebecca Vega-Thurber suggests that high water temperature is not the only factor*. Overfishing and nutrient pollution make reefs more vulnerable for effects of noxious bacteria that cause diseases of coral. But these effects are further acerbated by extreme high water temperatures. So thermal stress seems to to make corals more vulnerable to opportunistic bacteria. *‘Losses of corals worldwide emphasize the need to understand what drives reef decline. Stressors such as overfishing and nutrient pollution may reduce resilience of coral reefs by increasing coral–algal competition and reducing coral recruitment, growth and survivorship. Above-average temperatures exacerbate these effects, further disrupting microbiomes of unhealthy corals and concentrating 80% of mortality in the warmest seasons. Surprisingly, nutrients also increase bacterial opportunism and mortality in corals bitten by parrotfish, turning normal trophic interactions deadly for corals. Thus, overfishing and nutrient pollution impact reefs down to microbial scales, killing corals by sensitizing them to predation, above-average temperatures and bacterial opportunism’.